Our Custom-Imprinted Magical Message Box allows you to perform a wide variety of tricks with playing cards, business cards, message cards, and more! No skill whatsoever is required to perform this Classic Magic Trick. A two-sided instruction sheet is included with each Trick to explain the numerous Tricks that can be performed. One great Magic Trick that can be done, the "Appearing Card Trick", mysteriously produces the message or business card of your choice within the box. The trick works as follows: prepare the Trick by placing your card into the box and covering it with a secret flap that looks like the bottom of either side of the case. Then, show the box empty to your spectator, allowing the secret cover flap to fall to the opposite side and reveal your card or message! The Top of the Magic Message Box is custom imprinted with the one- or two-color design of your choice. Each Custom Magic Message Box Trick comes individually packaged in a sealed poly bag. For additional information of our Custom Imprinted Magical Message Box Trick, please contact us. 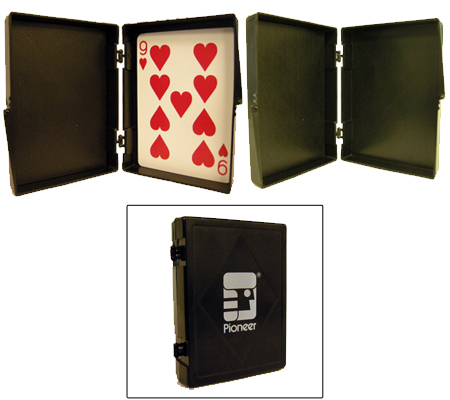 You may also be interested in these other fun, easy-to-perform, and memorable Promotional Magic Tricks: Mind-Reading Box in Cube Trick, Number Mystery Trick, and our Three Card Monte Card Magic Trick.